✔ The light source adopts high-quality COB lamp beads, energy-saving 3W, and perfectly eliminates the unreal feeling caused by the early SMD lamp beads graininess. The new generation of flame lamps has a more realistic flame even if you close to see the flame, can create a more realistic flame atmosphere✔ The new generation of flame lamps has upgraded the cooling method and maintains normal operation around the clock. 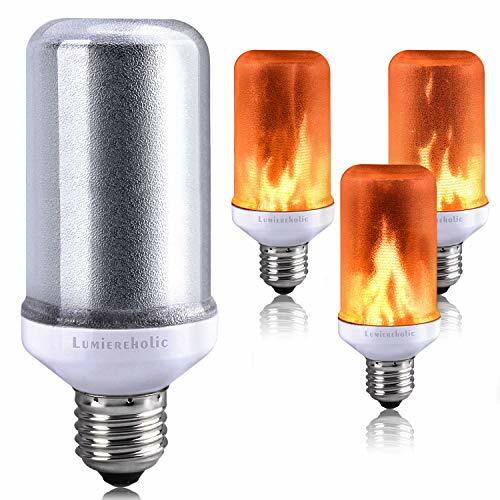 Newly-designed flame lamp life up to 50,000 hours✔ 3 mode smart chip control, you can change the mode by switch the button quickly:Mode 1,：permanent open, can be used as lightingMode 2： flame mode, adding atmosphere to various scenesMode 3： off✔ Tips: You can use more of this light at the same time to get better atmosphere effect.